Are you eating at home more? Recipe: Spring time is Rhubarb time! Word games - What is a "diet"? Does Food Choice Trump Food Miles? I always look at the dried beans available when I grocery shop. Last week I saw a variety I had not noticed before called Lupini Beans by Ziyad. In fact they were even marked at a 50% discount. Well, I'll usually try anything once, so into my basket they went. The directions on the back of the package say to keep changing the water until the bitterness disappears. Hmmmm, good thing I read the directions, and even then went to the internet to find out more info, before just cooking them up like other beans. I learned that lupini beans are commonly consumed in Mediterranean and Middle Eastern countries, often eaten like popcorn at bars or movie theatres. I also learned that they contain bitter molecules called alkaloids that do need to be removed by repeated soakings before eating (both from a taste perspective but also from a health perspective as these molecules can lead to a variety of unwanted side effects). After all this reading, I finally noticed that the bag I picked up said it was "small sweet" variety, which means it has been bred to have lower amount of these alkaloids that need removing. After all this soaking, they can be served drizzled with olive oil and freshly ground pepper. I served them last Saturday night along with pasta and a spring greens salad. They are not soft like other cooked beans but have a little heft to them. The skins are a little tough, they can be slipped off, but they are edible. 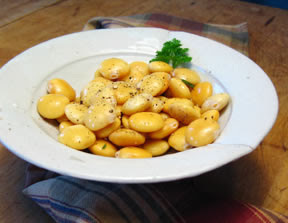 Lupini beans do have a high protein content (almost as high as soybeans) so they are great to serve as an appetizer or side dish when the meal does not have a major protein source. The internet info says that they last a long time kept refrigerated in a brine solution. I cooked up the entire 1# bag, which made about 4 cups of cooked and soaked beans. I have some still in my refrigerator, but I have actually frozen the remaining beans to use at a later time. We did have guests for dinner. Here is the blessing we used. It seemed appropriate for this boisterous group! Good food and good friends do lead to refreshed hearts! That dish looks interesting and the recipe is very easy. I think I will try that too. The protein rich beans will be great for health and the super simple dish will save me a lot of time. The soaking over several days does take some planning (and remembering!) but then you've got a healthful, delicious, low-cost dish that is also fun to eat. What could be better than that?! Enjoy. Thanks for stopping by to share your comments! You've inspired me to find some more lupini beans to enjoy. Yummmm, garlic powder or fresh garlic makes everything even better! Your suggestion will make a great recipe to hand out when we are back to selling our garlic in August. I was on the internet looking ofr lupini bean information. AS a long time consumer of lupini beans I was interested in the nutritional content and found youir website. You are obvoiusly on the right track regarding the healthy preservation in the face of cancer. I beleive life is holy, and every moment precious, that is why we owe it to ourselves to eat healthy in order to go on enjoying the gift of life. "I believe life is holy, and every moment precious, that is why we owe it to ourselves to eat healthy in order to go on enjoying the gift of life." Thank you for sharing such beautiful words. I whole-heartedly agree with you. I hope you will stop by my blog again! As well my Italian grandparents introduced us to this snack. I have been making these for a long time and about five years ago introduced a twist. I added dried fava beans as well. I boil the fava beans for five minutes, then add the luppini and boil both for twenty-five minutes. Cool, rinse, put into a container with water and add sea salt. I rinse and change the brime solution daily for about fourteen days. Eat the fava just like the luppini or remove the fava, place in a little olive oil and fresh garlic for a few hours on the counter and serve. In Portugal, besides eating the "tremoço" (Lupini bean)as americans eat popcorn, we sometimes use it to lower blood sugar in the blood (diabetis). Leave a dry uncooked and unsalted bean in 1/3 glass of water overnight and in the morning drink it all up, bean included. Also know someone who does this, but for lowering blood pressure - and it does! Apparently it re-balances the system. This works, but do your own research on the subject! i read all the above and i grew up with these littles buggers and love love them, i would love to share a bit of light here, you don't have to soak them n change the water for a week. heres what you do soak them over night or use warm water and leave them alone for a few hours like any bean them will do there job and come to full life. in large pot with fresh water more than cover them cause they will take time to cook like 2 to 3 sometimes 4hours i take one out and pierce it with a fork. if easy its done if you have to force it let cook more , i don't like them too cook but not too crunchy either . so if you over cook them don't worry than you can eat the skin, extra fiber. now let them cool off and they will put a smell of like bitter in the air no worries you got about 4,5 days to go yet. now i put them in a laudry bag like for my delicates cause it has a zipper so it makes it easy and now put it in large large pot full of cold water let sit at room temp in cool area nd change water 3 to 4 times a day so here's when the whole family gets involved everyone knows the beans are soaking when you get home change water doesn't matter how many times the more the better the water gets golden yellow thats the alkaloids or the bitters leaving you'll know when they are ready cause you soak for the whole day and its not bitter ,almost ready now in my native country Madeira isl (portugal) this is whem we add sea salt and whole pressed garlic to the water let sit in fridge for a day or over night and enjoy at this time i put in covered containers or zip lock bags with garlic mix, my italian husband now takes some out adds olive oil italian seasoning and he has his chilhood snack . I've never had to freeze them cause all my friends love them and trust me they are addicting when you start eating them theres no stopping but we use them for snacking always at holiday's as appetizer's never never goes on table as [part of a meal, think of them as peanuts you would not add them to your buffet right.